For more than fifty years I have been shooting out the car window while driving. As crazy as this sounds it may be a lot safer than talking on a cellphone while driving, not to mention texting, or putting on makeup, which I once read is the largest cause of traffic accidents in Los Angeles on a daily basis. My first ‘from the moving car photos’ were made from my VW bus back in 1964 when I drove all around America on my first long car trip. What was so amazing about this revelation – that one could shoot while driving – was that I saw myself driving as if I was inside of the camera, and that the car window was the lens, and that life was streaming by me and all I needed to do was to raise my camera and reach out for it, and then the irretrievable moment was snatched out of the passage of time. I have made many thousands of images this way and I never tire of the challenge and the surprises that show up on film, or now, the screen. This moment was just what you see. 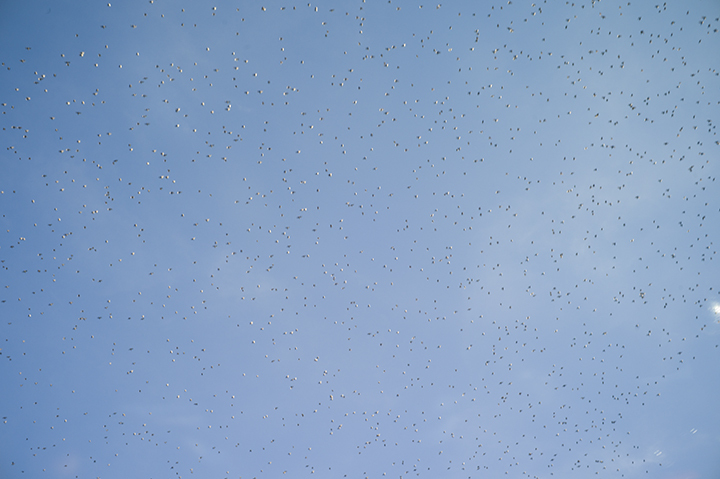 A migration or flight of uncountable numbers of birds, flickering in sunlight and then gone. This entry was posted in Uncategorized on January 7, 2015 by joelmeyerowitz2014. on that sad day that revives, to some extend, the terrorist attack of the WTC, it is important to appreciate all those little, furtive moments that Life gives us and that are usually taken for granted by most of us. One can be in NYC or in a quiet village lost in the Lubero, these moments are precious even if we don’t (take the time to) see them. Thank you so much “to push yourself to try and see something of interest in the most quotidian moments of daily life” and to show us that we have to do the same. This is really wonderful. You have a great eye, Mr. Meyerowitz, and whatever you share with us will be at lease “interesting”. But this shot is wonderful. Greetings from Los Angeles!